There is no mistaking the three-dimensionality of Sequential One, through the dial’s several layers and the sheer volume of the case. At first glance, the hour markers on the prism paired with the minutes central disk offer instant and intuitive reading through the unique display. The complexity of the dial’s architecture reveals the beating heart of the movement, highlighting the Côtes de Genève hand finish of the cross bridge. The designer took inspiration from the elegant designs of classic 1940’s British automobiles. This approach represents one of the key values of the brand: a permanent and authentic quest for elegance, combined with an audacious taste for adventure. The technically complex sequential time display was fundamental in developing our own mechanical movement to drive the timepiece. The power required to drive the movement, spin the sapphire minutes disk and turn the prisms presented a considerable horological challenge. To meet the challenge, MCT has produced a complex, highly reliable hand-wound movement of 471 components. The dial has a unique and technical aesthetic: while four modules display the hours by means of five triangular prisms, which pivot to reveal the time, a central minute disc turns successively 90° counterclockwise each hour to display the time. The Sequential One features the enchanting and extraordinary Breguet terminal curve which controls the rhythm of the movement. 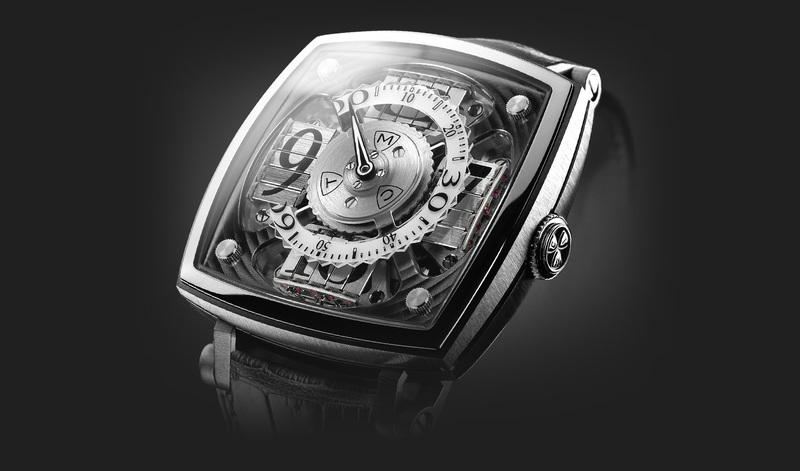 When fully wound, the Sequential One has a power reserve of 40 hours. Never before had the dialogue between hours and minutes been so playful and clear. Sequential One – S100 is the point where traditional know-how meets freedom of creation. The elegant soft lines of the 45 mm watch case are crafted from 18 carat white or pink gold. Each limited to 99 pieces. The watch display is viewed, front and back, through sapphire crystal glass which is treated with an anti-reflective coating. A sapphire insert placed between the components of the case brings light into the movement, revealing the fine details of the micromechanical finish. The lug collars which anchor the strap are a unique feature of the Sequential One. These collars were carefully designed to allow the timepiece to rest easily on the wrist and to add a touch of refinement and singularity. Sequential indication of the hour on prisms. Minute’s indication on a jumping rotating sector. Seconds on the back. MCT-S1.0 mechanical manual hand-winding movement, developed and assembled by MCT. 37.40 x 37.40mm (16 1/2 linen), H 4.35mm without module, 10.75mm with module. 471 components . Bridges hand-chamfered and adorned with “Côtes de Genève” . Traditional Breguet terminal curve. Patented system for rotation of the sapphire Minutes disk and for accumulation of energy. Frequency 18,000 A/h (2.5Hz). Indication of the Minutes on 270° sector. Power reserve of 40 hours. 81 Rubies. 45.00 x 45.00mm, H 15.5mm in centre and, 7.10mm on the edges. Crafted from 18 carat pink or white gold. Composed of 41 parts. Front crystal made of sapphire with double anti-reflective coating. Rear crystal made of sapphire with anti-reflective coating on the inside side. Middle crystal made of sapphire. Minutes: rotating minutes dial crafted from sapphire. Alligator, double hand stitched with anti-allergic inner leather. Double deployment clasp.